DESIGNER WEEKENDS: SHELL ART COLLECTIONS! Each card on the wall held a small collection of shells, along with the name of the guest who found them and the date. We loved this idea as a way to preserve memories of friends and family visiting the beach. RB Home Design is now selling our Shell Collection Art Kit, which will allow you to create your own art wall at home. The Art Kit is $40, including fifty 2"x3.5" cards, twine, hat pins, a hole puncher, and everything else you need to get started. Additional cards are sold in packs of twenty-five for $10. All you need to add is the shells! If you're interested in purchasing our Art Kit, please email us at regan@rbhomedesign.com. We've also put together some our other favorite ideas for turning your shell collection into art. 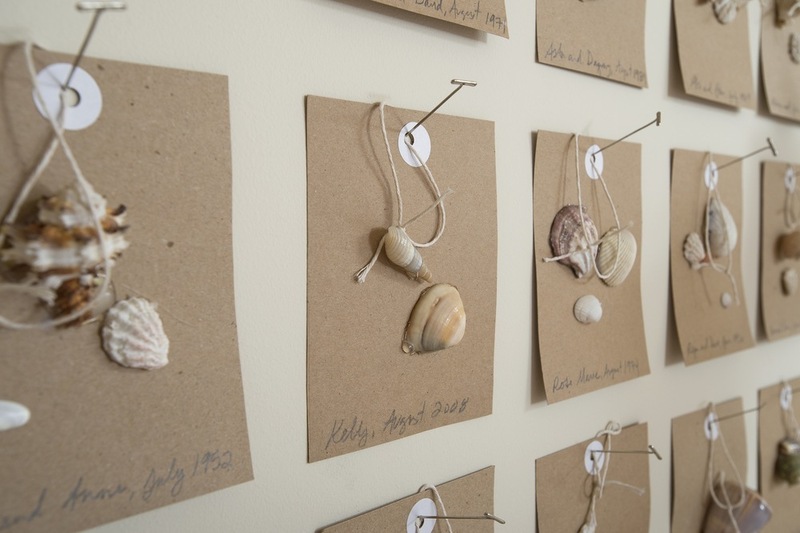 Kim Wilson came up with a crafty way to organize and display the various types of shells in your collection. She gives you step by step instructions for creating your own framed shells on her blog, Sand and Sisal. 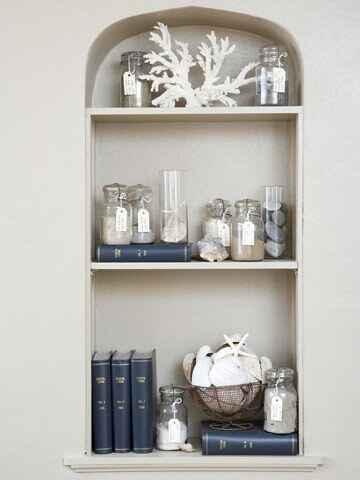 If you've found shells big and small, a great idea for display is to create a shell niche or bookcase. The image above, from Better Homes & Gardens, shows us how. To display smaller shells and sand, we like the idea of using mason jars or glass boxes. Larger shells can often stand on their own or be supported by an acrylic plate stand. Dorothy Reinhardt has come up with a terrific way to display shells collected from different regions. She pasted shells she found on Sanibel Island to a nautical chart of the area, framing the display inside a shadowbox. She tells you how she created the look on her blog, Dorothy Reinhardt Designs. We have always been in love with the shell themed decor of Marian McEvoy's home (photo courtesy of Profimedia). As former editor of Elle Decor Magazine, her style is elegantly chic. Maybe for the next show house we'll skip the note cards and go straight to gluing the shells to the walls, millwork, and ceiling?